You cannot apply for your practical driving test until you have passed the Theory Test, so we would therefore advise you to start studying for the Theory Test straight away. You cannot apply for the Theory Test until you have a provisional driving licence, and you cannot take the test until you are 17 or over. You don't need to have passed your Theory Test before starting your driving lessons. Your lessons can start as soon as you are 17. The Theory Test is in two parts - a computer based multiple choice question section and the Hazard Perception Test. Before starting the Theory Test you will be allowed an opportunity to practice using the equipment. During this time, staff will be available to help if you have any problems or questions. 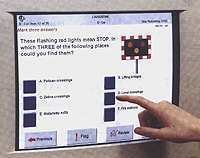 In the multiple choice section, questions will appear on the computer screen one at a time and you select the answers simply by touching the screen or clicking with the mouse. You can return to any of the questions later and change the answers if you want to. There are 50 questions in the test and you need to answer 44 correctly to pass. You are allowed 40 minutes for the test. The second section of the Theory Test comprises the Hazard Perception Test. This consists of 14 video clips which are viewed on the computer screen and each of which shows typical road scenes. In each clip there will be a developing hazard which you are required to identify by clicking a button on the mouse. One of the clips will have two developing hazards. The earlier you click on the developing hazards the more points you score. You must score at least 44 out of a maximum 75 points to pass this part of the Test. You will then be informed of your result at the end of the Test. If you have any special needs or difficulties with English then help is available. You can choose to listen to the text being read in English through a headset which should help those with dyslexia and other reading difficulties. Twenty-one other languages are available. The Driving Standards Agency (DSA) recommends that you should study The Highway Code, Know your Traffic Signs and The Driving Manual. They also publish The Official DSA Theory Test for Car Drivers which contains the total bank of over 1000 questions with advice on why certain answers are correct. Interactive CDROM's are also available which allow you to test yourself before the exam. There are over 150 theory test centres throughout the country. which are available at test centres.